Before the first issue of HIV Positive! magazine was published 17-years ago, the cornerstone concept for the editorial was our Positive Profile. The Positive Profile person exemplified our magazine as a whole by telling the story of someone who was HIV-positive yet not letting that stand in the way of fulfilling lifelong dreams, helping others or doing anything they want to do in life. For this issue, for the first time, we decided to go back in time just a bit and cherry-pick a handful of past Positive Profile people so you can see how many positive and inspirational people there are out there who are not letting HIV stop them for a single second. Michelle decided to enter the Miss Texas Plus America pageant in 2010 in an effort to show that people with HIV can accomplish anything and spread the word about HIV. She was third runner up in 2010 and decided to compete again in 2011. Michelle didn’t just stop the accomplishments with the Miss Plus America crown either. On May 11th, 2013 she graduated from Eastfield College with an Associates Degree in Substance Abuse Counseling. She planned to go on to get her Bachelor’s Degree in Social Work. Sam also became involved in the Health Options and Positive Energy foundation of Washington D.C. (HOPE D.C.) an all-volunteer organization that serves the HIV positive community in the Washington, D.C. area. He took advantage of their peer-to-peer contact, counseling and discussions. Maria met Dawn Marie Daniels and Candace Sandy, two women who were writing a book called Souls Of My Sisters. They wanted Maria's story to be included in their book. Maria wasn't sure about telling her story at first but then agreed to participate. She said, "Everybody was talking about Magic Johnson and that wasn't MY story. I had two kids that I had to support and that was MY story. I had to tell my story." She also got back to the entertainment industry that she had left and through hard work has become known as one of New York’s premiere promoters. She produced, directed and promoted her newly created, legendary music showcases held at the Shrine in Harlem, known as “Mad Wednesday’s,” which provide venues for signed and unsigned R&B and hip-hop artists and comedians who have had no other performance options. Through this work, Maria has created an outlet for young people to express themselves artistically. He started treatment immediately and was considered undetectable by the standards the military sets just over 1-year after diagnosis. Mike was a Petty Officer First Class and recruiter with the U.S. Coast Guard. Entering the Coast Guard on June 11th, 1996, he was on his 18th-year when profiled and planned to retire after his 20th. Thanks to his long time dedication to running and his medication, he’s doing just fine. She also started immersing herself in her art. In a 4-month period she made over 130 sculptures that were mostly scenes from her life. They helped her move through her feelings. She was encouraged to start showing her art and began at Visual AIDS, a New York based organization dedicated to supporting HIV positive artists, where her work won a $1,000 prize and a spot on their calendar. She also had her first showing at her church. “My pastor introduced me as the artist and wanted me to explain one of my pictures. As he waited for me to explain, I don’t know what came over me but I told the whole church that I had been a prostitute and was HIV positive. A hush fell over…and then everybody stood up and clapped, then a line formed and everybody…my pastor and family included, kissed and hugged me. The love just blew my mind.” Said Joyce. 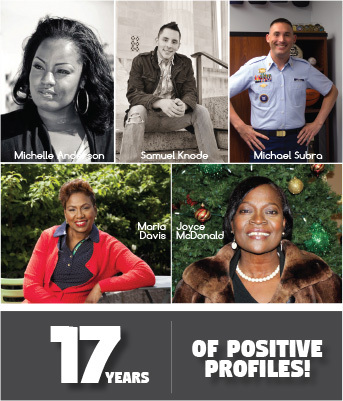 If you would like to read their full stories and see the stories of many other Positive Profiles, please visit: www.hivpositivemagazine.com/profiles.html.